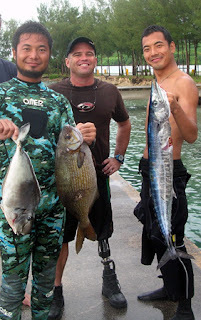 Spearfishing trip to the back side (East side) of the island. Stopped at Banzai on the way over. Did a bit of free diving at the base of the cliff, there is some airplane debrie at ~60 ft. No interesting coral formations, just rocks and small coral patches. Fished at a spot called Brady's Crack past Bird Island. The haul for me; one tiny goatfish.... I just hope it was legal size. 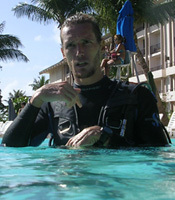 On the way back stopped at Banzai divesite. Saw 5 adult Napoleon Wrasses and hundreds of Jacks. Had to get out because of the strong current.